As a hoarder of art tools and stationery (I mean professional creative tools), I frequently dip into creative obsessions that last until the novelty wears off, and I purchase yet another new tool. Lately it’s been going on with fountain pens, which are my new go-to note taking and doodling tool. 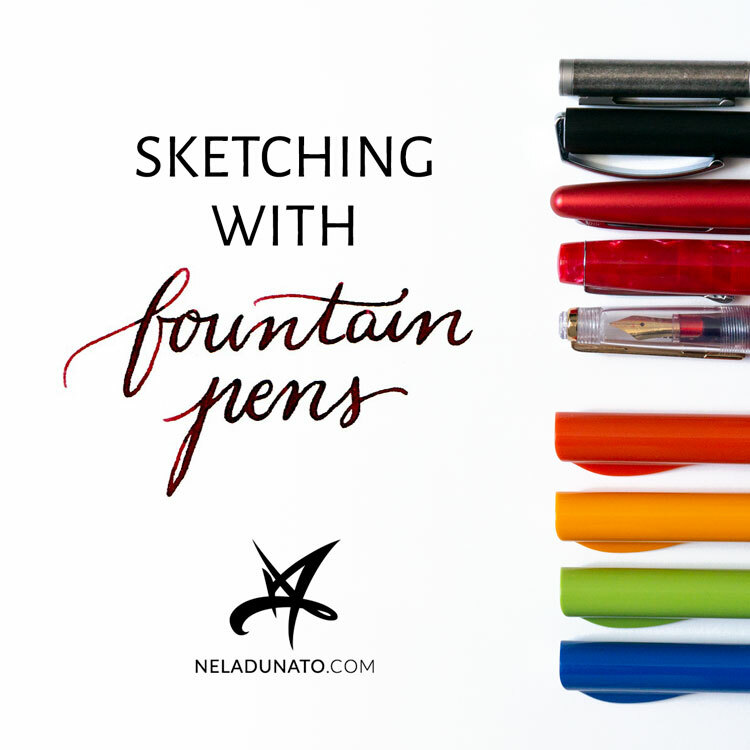 In this post I share why I switched from ballpoint pens to fountain pens, which pen models I’ve bought so far (there’s quite a few), and my impressions of writing and sketching with them. A few months back I had the presentation event of my book “The Human Centered Brand” at a local library, where I got to sign some books for my readers. I was signing them with my new fountain pen, and some friends commented on it suggesting I was doing it to be “fancy”. While I like fancy stuff, that’s not the main reason I started using them. You know those cool life hacks you find online and think “I should definitely try this”, but then you immediately forget about it? This usually happens to me, but this one time it was different. Some environmentalist dude posted an album on Facebook with tips on reducing plastic waste by switching to multi-use instead of disposable products, or at least products packaged in metal, glass, paper, or recycled containers. 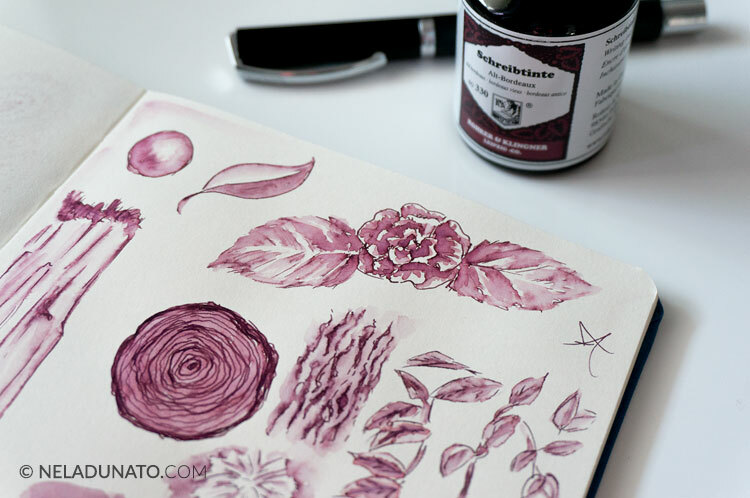 One of the tips included using fountain pens instead of ballpoint pens. Reader, I use a lot of ballpoint pens. I used to have one in each bag, and a couple more in my office. (I especially loved multi-colored ones, but I always run out of black and blue before red and green, so that sucked.) I don’t dare to even count how many pens I’ve thrown into the trash over the years. Is it weird that I didn’t even consider the environmental impact of my writing and doodling habits before I saw that Facebook post? Confronted with this realization, I decided to switch to fountain pens for good, and never bring home another ballpoint pen. Soon after that, I met the sci-fi writer Aliette de Bodard—a fountain pen enthusiast who nerds out on pens and inks on Twitter, and through her I discovered there’s a vibrant community gathered around fountain pens out there, which made the whole thing more enticing. I dove into online research and browsed through local stores in order to find the best pen for my writing and sketching style. I had two Pilot Parallel calligraphy pens for a couple of years. Wide as they are (2.4mm and 6mm), I didn’t perceive them as writing pens, but for the sake of accuracy I’ll let it be known that these two were my starting point—apart from those, I had no other fountain pens. My current collection of affordable fountain pens. Writing samples closeup is posted below. Before splurging on new ones, I tried to locate old pens I used in elementary school to see if I like it. I was pretty sure there was a nice Parker among them, but alas, my mom couldn’t find it, and I didn’t have time to go through all the boxes with my old stuff. My mom did find a different no-name pen I didn’t recognize, and I started using it. It’s fine, dry, scratchy, and heavy (made entirely out of stainless steel), but it served me fine in my early tests. I still use it for to-do lists and quick notes on scrap paper, but longer writing sessions with it are not so enjoyable. Next, I went into a local Müller store with a gift card to spend, and found that they carry two german brands, Lamy and Online. I heard good things about Lamy Safari and Al-Star, but couldn’t find a single one with an extra fine nib, and the weirdly shaped plastic body did not excite me much. I chose a black aluminium Online Vision instead which came with a (so called) extra fine nib. I also got a converter and a couple of bottles of cheap Pelikan 4001 ink so I can avoid disposable cartridges altogether. The Vision was quite nice, but still too thick for my taste, and thicker than the no-name steel pen. OK for writing and taking notes, but I didn't like it so much for sketching. My search was not over. ...until I got greedy for flex. Being a hand-lettering and calligraphy lover, I got interested in flexible nibs for cursive writing. 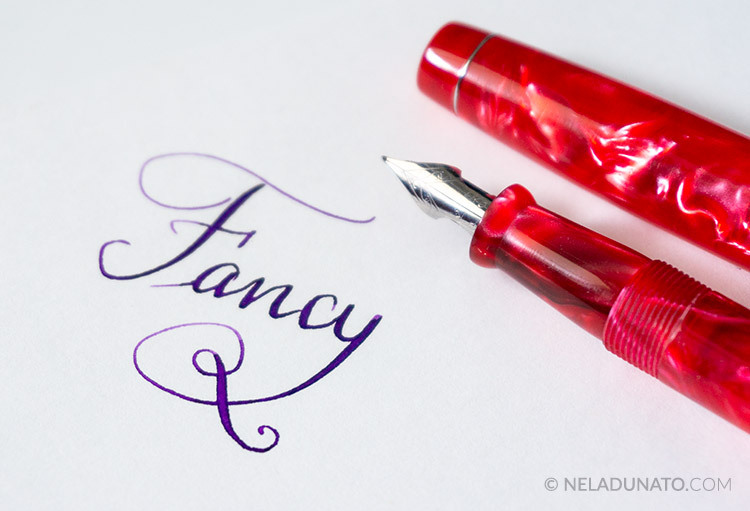 I enjoyed cursive writing with a dip pen, and wanted to see what it’s like to write with a flexible fountain pen. According to my research, Fountain Pen Revolution is a brand that offers the most flex for the buck. I bought their Himalaya pen in Sindoor Red body color with an ultra flex nib upgrade for a total of $42 USD (plus shipping). Fountain Pen Revolution Himalaya pen with ultra-flex nib and Pelikan 4001 Violet ink. 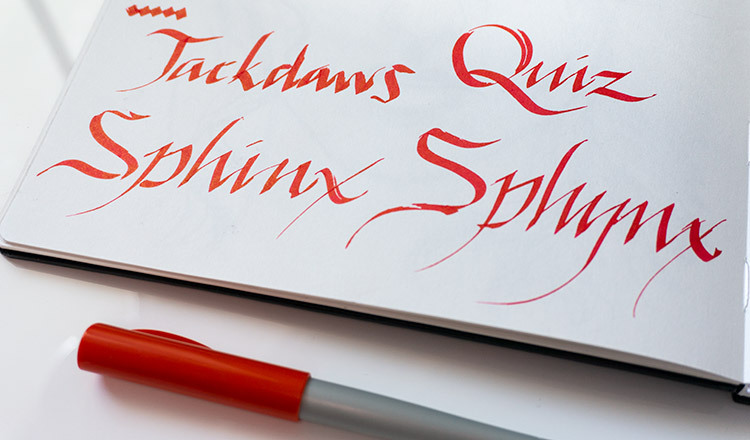 This is a super fun pen to play with and wonderful for calligraphy practice, but not something I would use daily. At its thinnest it’s just like the Online Vision EF, but so much wetter and drinks up ink very quickly. I need to wait a while before flipping the page, which makes it impractical for writing notes. It also requires better quality paper in order not to feather, while my other pens can write on most papers without any issues. But the cursive and the flourishes look amazing, and I’m really happy that the flex nib has lived to my expectations. Sadly my pen arrived with a cracked section (I can’t tell whether it was damaged in transit or just poor quality control), so I requested a replacement part which has yet to arrive. In the meantime I’m making do with this one and try not to get ink on my hands. Fountain Pen Revolution adds a free cheap pen to each order over $25, so alongside my fancy Himalaya I also received a transparent plastic (aka “demonstrator”) pen called Muft. While I didn’t need it, having an extra one to fill with different color inks is useful. This pen writes nicely, but has an awful synthetic smell that clings to anything it touches so I don't use it much. Fountain pen writing samples on 200 gsm copy paper. Ink used: 1. Pelikan 4001 Brilliant Black. 2. Pelikan 4001 Violet. 3. Pelikan 4001 Brilliant Black. 4. Pelikan 4001 Violet. 5. Pelikan 4001 Brilliant Red. 6. Pilot Mixable Colour Black. 7. Pilot Mixable Colour Blue Black (diluted with water). 8. Pilot Mixable Colour Red. 9. 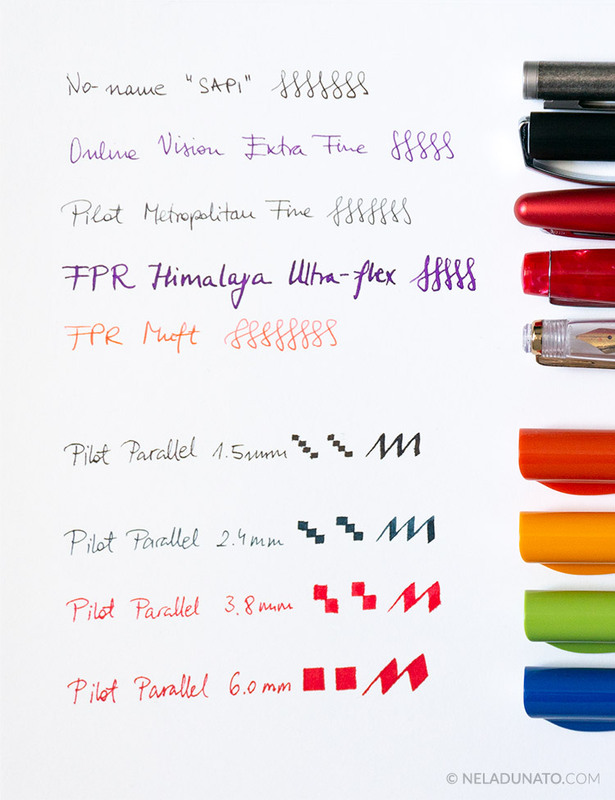 Pilot Mixable Colour Red. During all this pen and inks research my interest in calligraphy was revived, and I bought the remaining two sizes of the Pilot Parallel pen so now I have a full collection, and this brings the total number of my pens to nine—five regular writing pens and four calligraphy pens. That’s the story of building my lovely fountain pen collection. I think I’m done shopping for pens for a while... Though the thought of another Pilot with a “stub” nib for even smaller italic cursive is appealing. Switching to writing with fountain pens was easy and I don’t miss writing with ballpoint pens at all. The biggest challenge was remembering to move the pen from one bag to another. Since I mostly write with fine nibs and I’m right-handed, smudging or bleeding was less of an issue. I just need to be more careful with pairing different pens, inks, and paper as in some notebooks some of the ink in some of the pens will feather or bleed though. I think my handwriting looks nicer with fountain pen ink than it does with any fine-liner, ballpoint pen ink, or gel pen. My handwriting as of early 2019 - a mix of script and printed letters. We'll see if I can turn it into a nicer script in a year. This was less straightforward than I'd like. Back when I started sketching regularly during my university years, I used a ballpoint pen daily. I liked them because my pen drawings didn’t smudge as much as graphite drawings, but I also learned to appreciate their texture. Getting gradual shading was easy with a pen like the Pilot Better Retractable Fine, my all-time favorite. 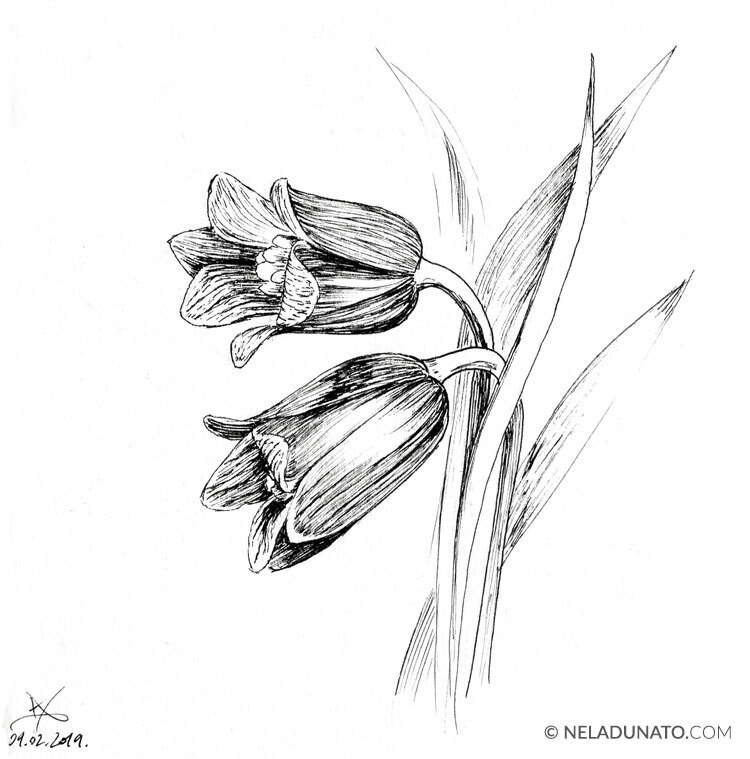 I didn't use any pencil outlines—I would only use a pen, and the beginner lines would be barely visible in the end. I liked that a lot. Fountain pens can’t emulate the most delicate of lines made by ballpoint pens, nor can they achieve graphite-like tonal variation. 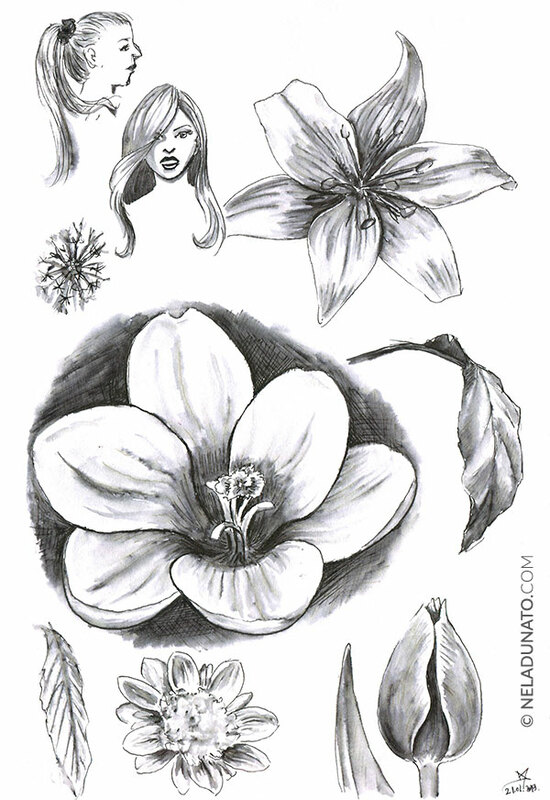 They’re more similar to fine-liners, and shading can be achieved through hatching, stippling, scribbling and washes. That’s not bad, but it will take some getting used to. I’ll miss ballpoint pens for sure. Since I can't achieve subtle gradients by delicate hatching as I would with ballpoint pen, I started experimenting with other forms of shading, and creating more expressive drawings with lots of wobbly lines, instead of clean, precise lines. What I loved about ballpoint pens is that I didn’t have to use a pencil to sketch out the outline beforehand. What if I didn’t use a pencil before sketching with a fountain pen too? How would my drawings change if I didn’t know for sure what the right move was? (That’s a glove thrown straight into the face of my perfectionist tendencies.) I let myself experiment and use texture to cover up the earlier, exploratory lines which were “incorrect” and it resulted in quite different drawings than I usually make. This effect becomes especially cool with darker color ink where more of the actual tone of the ink is revealed by watering it down, while the crisp dark lines provide structure. I've only tested it with a couple of shades so far, but I have a few others I expect to look pretty interesting with this technique. I avoid combining water soluble ink with watercolor because when I sketch, I think about outlines and darkest shadows first, and then think in color and tone. Folks who use fountain pens usually paint the colors first, and then go over them with an outline. I don’t want to switch to this process. I'm planning on buying waterproof fountain pen ink soon so I can combine it with watercolor, and I'll post an update once I try it out. I adore drawing with brush pens—they’ve been my absolute favorite inking tool for years. 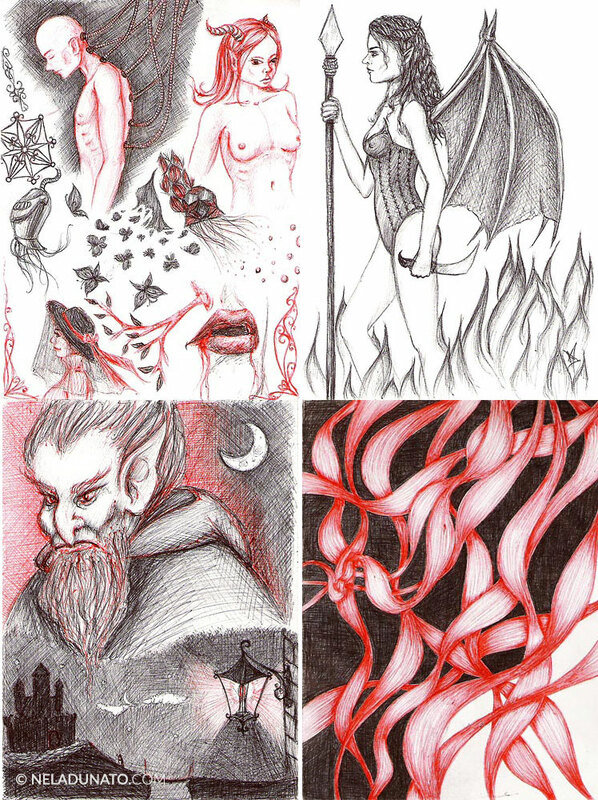 (You can see some examples of my ink drawings in my sketches gallery.) 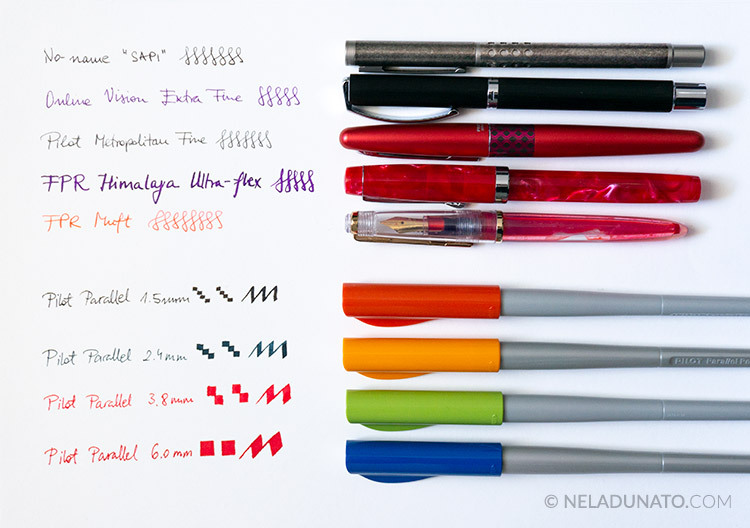 I was wondering how flexible fountain pens compare to them since some artists seem to like those. I attempted to do a couple of drawings relying on the nib flexibility to get an expressive line—what you’d get when drawing with a dip pen. I didn’t enjoy it. The nib is stiff and while it works for shorter vertical lines, when I attempt to create a long curvy line going from thick to thin or vice versa, it’s a struggle. I had to turn my paper all the time so that I could create thick strokes where they should be, because unlike with a brush pen, the thick stroke only works in one direction: from top to bottom. I was much slower. Filling up large surfaces is tedious too, which you can see on the sketch below. 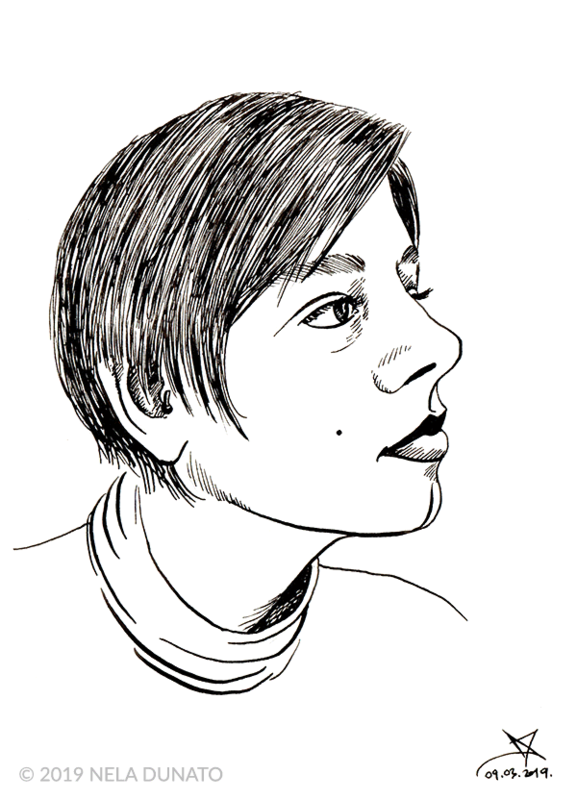 Not my best self-portrait, but it will do for a demo. I would not use a fountain pen in lieu of a brush pen. The brush pen is unparalleled in creating thick expressive lines and extreme line variation with ease. I would use it for drawings where I expect most of the lines to be thin, and only occasionally use a thicker line to mark strong shadows. Especially when I turn the nib on he reverse sides, I can achieve super thin lines, so I'll be experimenting more with that. Some artists use flex pens in much the same way I use brush pens. I assume it’s about getting your hand used to it. I have a very light hand, so creating thin and delicate strokes with a brush pen is not an issue for me. For those with a heavier hand, the resistant steel nib could provide more control over line variation. Fountain pens are not the best replacement for ballpoint pens if you do a lot of gradual shading. They’re a decent replacement for disposable fine-liners if you fill them with waterproof and lightfast fountain pen ink (not india ink!). Regular writing ink is not to be used in final artwork that’s meant to be displayed or sold, but it’s good enough for sketchbooks. Plus, the ability to use the ink wash technique is fun. Another important thing to be mindful of is paper. 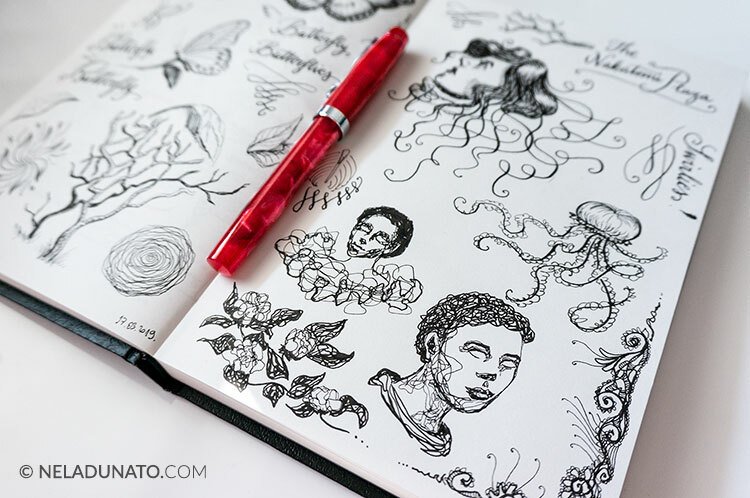 Ballpoint pens and fine-liners work on any sketching paper, while fountain pens require sized paper with little to no texture, otherwise you’ll get a blurry feathery mess. 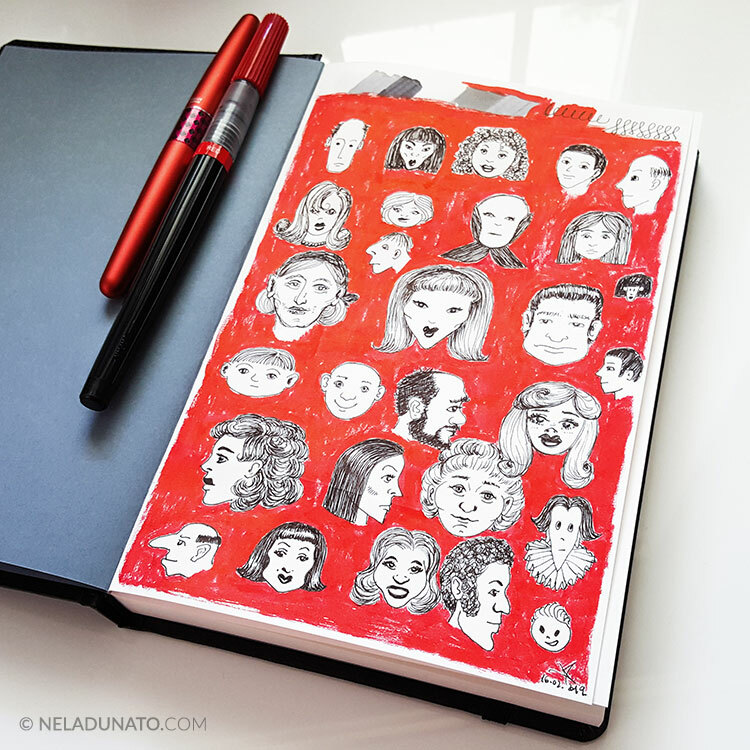 If your sketchbook is intended for dry media only, it will not work with fountain pens. Sadly this means most of my Hahnemühle sketchbooks are not suitable for fountain pens, but my favorite Canson sketchbook is. I stand by my decision to stop buying or accepting free ballpoint pens because the sacrifice is more than worth it, and I’ll be looking more into where I can substitute single-use art supplies with reusable ones. Have you made a switch to more sustainable art supplies? How difficult was it for you to get used to them? 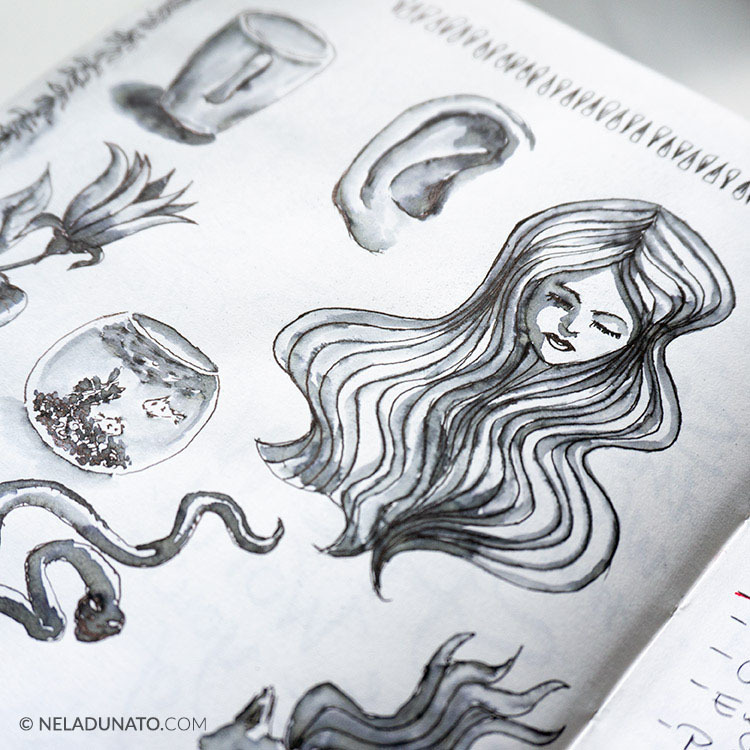 Do you still miss the old supplies, or is your new alternative fulfilling all your creative needs? Let me know in the comments—I’d love to hear about your experiences. *Crickets* No comments yet, be the first!